A sticky, parched sensation in the mouth and throat. Some patients describe this as a “cottony” feeling. Difficulty speaking or swallowing food. Sores or tender spots in the mouth or on the lips. Make an appointment to see your dentist if you notice any of these warning signs. Potential causes of the problem include side effects of certain medications, such as antidepressants or high blood pressure pills; diseases such as type II diabetes; nerve problems due to head or neck injury; and side effects of chemotherapy or radiation therapy. 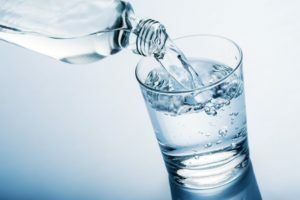 Keep a glass of water or other non-caffeinated beverage handy and sip on it throughout the day. Avoid using soda or alcoholic beverages for this purpose, as they can sometimes worsen dry mouth symptoms. Use a humidifier. Sometimes dry mouth is a result of dry air. This is especially likely during the winter, when hot, dry air circulates throughout homes and workplaces. Use sugarless gums or mints. Try to keep these in your mouth for as long as possible instead of popping one after the other. Sometimes dry mouth is caused by emotional tension or unease. Brush your teeth 2-3 times a day using a soft bristle toothbrush and a toothpaste that contains fluoride. Look for products with the ADA seal of acceptance on the packaging. Floss at least once per day. Flossing removes food particles and other potential sources of plaque and tartar. Stay away from all forms of tobacco and vaping products. Both can curtail saliva production, causing dry mouth and putting you at risk for cavities and other oral health conditions. Dealing with dry mouth is something that most of us will face from time to time. The tips in this post can help you to manage the problem until you get professional care. Following your dentist’s advice is a great way to lay the foundation for a happy and healthy 2019. We wish you and yours lots of happy smiles in the days and years to come. at their Dr. Angelo M. Julovich grew up in Merrillville and is proud to call Indiana his home state. Dr. Julovich earned his DDS degree from the University of Indiana School of Dentistry. You can reach his office online or by calling (317) 769-3335.